Short break hotel accommodation in the city. Guests looking for accommodation in Edinburgh should make sure to take a look at the Britannia Edinburgh Hotel, which not only has 178 spacious rooms but also has convenient amenities for residents, such as Free Wi-Fi and quality dining options. 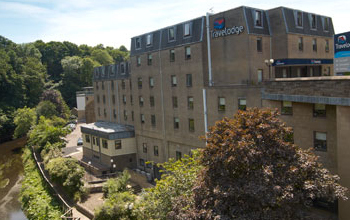 This former Travelodge sits on the river's edge in the West of the City, and is close to all the main attractions and tourist hotspots in Edinburgh. Tourists and business travellers who like to save money on their hotel stays in Edinburgh are advised to book direct on the official Britannia website, where they will be guaranteed the best deals on rooms that feature TV, tea and coffee making facilities and comfortable beds. For price, location and facilities, Britannia has one of the best Hotels in Edinburgh, and prices for the Britannia Edinburgh Hotel are extremely competitive when compated to those of other hotel chains, guest houses and B&B's within the city.